Sign up to receive the FREE weekly NASBP SmartBrief. Sign up to receive the FREE quarterly NASBP Surety Bond Quarterly magazine. 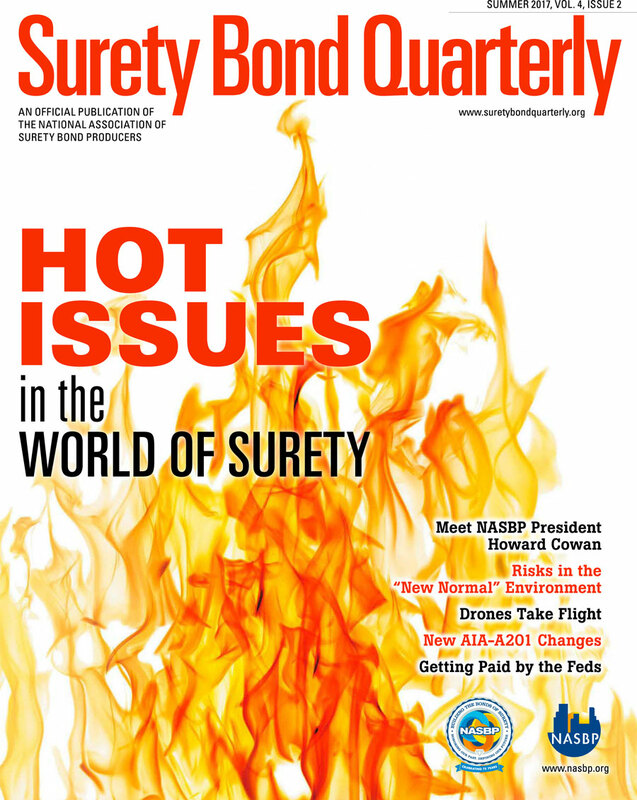 Surety Bond Quarterly -- Surety Bond Quarterly, the Association's first quarterly, professional magazine, offers insights and information for surety professionals as well as others who need to stay up-to-date on the industry’s latest news and developments. The complimentary magazine is distributed to the NASBP membership as well as project owners, public officials, subcontractors, contracting officers and others who are affected by developments in the surety industry. Surety Bond Quarterly is published in the winter, spring, summer, and fall. The fall issue features a free Resource Directory of the entire NASBP membership. Surety Bond Quarterly is available in high-gloss print as well as digitally. NASBP invites anyone to view past issues: Sign-up to receive the FREE Surety Bond Quarterly. Pipeline--The NASBP e-newsletter, Pipeline, is an electronic newsletter that informs members, affiliates, and associates of current surety and construction industry issues that affect their businesses and that announces the Association’s policies, initiatives, and meetings.Pipeline is distributed every other month. NASBP SmartBrief--NASBP SmartBrief, NASBP’s FREE, e-newsletter, conveniently brings the news that matters to surety professionals, project owners, public officials, subcontractors, contracting officers and others every week. By featuring snapshots of articles from leading construction and insurance industry resources, NASBP SmartBrief helps many stay informed on news, people, markets, and policies impacting the surety product and the surety industry. NASBP SmartBrief is FREE, but recipients must sign up to receive it. They can unsubscribe at any time. Be sure to sign-up for NASBP SmartBrief to save time and keep informed. Focal Point--The NASBP e-bulletin, Focal Point, is an electronic bulletin that provides concise, bulleted summaries of key legislative and regulatory developments, of information on industry partners and NASBP joint efforts, and of initiatives NASBP is pursuing on behalf of its members. Focal Point is distributed twice per month when most states are in legislative session (and less frequently when most states are out of session) to NASBP's grassroots network and strategic partners. Guides -- This is a convenient list of excellent resources and guides that NASBP has compiled for the membership's every day use. Blogs -- Check out the NASBP Blogs to learn about the latest issues that surety bond producers are facing as well as announcements about educational and advocacy events from which producers and underwriters can benefit from attending. Press Releases -- NASBP press releases announce initiatives, events, and publications the Association has pursued to advance the surety industry often jointly with other organizations in the surety, construction, and insurance industries. Highlights - The Year in Review -- The NASBP Highlights - The Year in Review is printed in December and highlights NASBP’s many accomplishments that occurred throughout the year. It is also available to view from the NASBP website. NASBP Awards -- NASBP recognizes excellence in the surety industry with these two awards. First, the Bruce T. Wallace Award, established in 1990 in memory of the Association’s first executive vice president, who served for over 29 years, is awarded by the Executive Committee. Second, the award, titled the John ‘Jack’ J. Curtin, Jr. President’s Award, honors an individual, who is chosen by the NASBP President. The President's Award was first presented in 2007 to John “Jack” J. Curtin, Jr., for whom the award is named. These awards are usually announced at the NASBP Annual Meeting held in the spring.